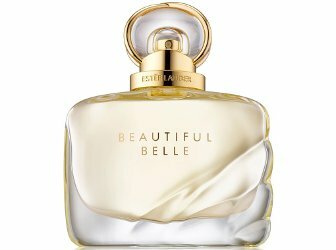 Estée Lauder has introduced Beautiful Belle, a new floriental fragrance for women. Beautiful Belle is a flanker to 1985's Beautiful. Love breaks all rules. Fall head over heels for this irreverent blend of lychee, mimosa, rose petals, orange flower, gardenia and marzipan musk. Romantic, carefree and irreverent. Modern love is a journey: the first shy moments of attraction, the full-blown romance, the promise to commit forever. First, the thrill. Happiness that is effervescent and contagious sparkles with notes of lychee, rose petals and mimosa. Filling the air with the beginning of love. Second, the romance. Deep in the heart, the magic begins. Head-over-heels passion. The full-blown romance. A floral bouquet of orange flower, gardenia and tuberose. Luminous. Rich. Feminine. Third, the promise. A love so strong you can't live without it. Captured in vibrant oriental notes of orris root, a blush suede accord, marzipan musk and ambrox. Sensual with a hint of irreverence. Deep. Forever. Beautiful. Estée Lauder Beautiful Belle is available now at Macy's, in 30, 50 and 100 ml Eau de Parfum ($70 - $125) and in matching body products. A 6 ml rollerball will be $28. Am I crazy for liking this copy? It’s a little saccharine but at least makes sense in terms of perfume structure. It is similar to a lot of what EL writes…and yes, it has the virtue of giving you a decent idea of what the scent might be like. I read it to the end, so that’s something. And I picked up on the idea that the fragrance is irreverent. Ha – I actually did not pick up on that, but I notice it now. I’m sure saying that is about trying to be cool/rebellious but it’s funny to think of EL being irreverent and in a fragrance. Anyway, although I’m not a fan of Beautiful, the notes here look agreeable to me, so I’ll try it if I see it (and if I’m feeling irreverent). This sounds like a good one…..Will definitely be sampling whenever I mosey over to Macy’s…..
I’m with you JadainGA….I will try it when I swing through the mall. EL has a few good ones that I keep in my collection and they are reasonably priced. I wasn’t a fan of the original “Beautiful” (I remember it would literally peel my nail polish off), but I’m open to try this one. I really can’t decide if it sounds good to me or not, but I do like the idea of “marzipan musk”. Well I tried it yesterday and gave it the full spraying. I could definitely smell the fruity lactones notes of peach/litchi up top. I am not sure I really felt 100% comfortable at first but then it developed into a creamy white floral perfume with light notes of suede and yes maybe marzipan. I tried it at Macy’s/The Domain in Austin. I had to go to Nordstrom nearby and was complimented by one of the SA there. Later at work, one of my colleagues noticed a change in my perfume and said she liked it very much. She described it as less floral, creamier, than my signature scent which is Private Collection Tuberose Gardenia. I prefer my signature perfume yet I might buy a bottle of Beautiful Belle. I felt nice and comfortable in it, I got more compliments during the evening. Except for the floral aspect, it does not smell like Beautiful at all. Tried it yesterday around 3pm, I can still smell it now at 10 am. Good longevity. Yes, I thought the copy was a good one too, for a change. I don’t like the original, and I probably wouldn’t like this one either due to the ingredients but I did really like Beautiful Sheer! And the pure perfume bottles are lovely! Well, I got a good spritz of this at Belk yesterday. Verdict: I don’t like the opening at all, but the drydown is very nice. I definitely got the sweet marzipan base, which was pretty. Lasted the rest of the evening, so longevity is good. Why is it so hard to get samples for new releases? The SA had no samples but hoped I’d buy a bottle? Without a full testing? I did the same thing yesterday and I am with you on this one. Not crazy about the opening notes but quite lovely to wear when it develops into a creamy white floral perfume.